This picture is from Dover's Weekly Sampler which arrived in my inbox today. 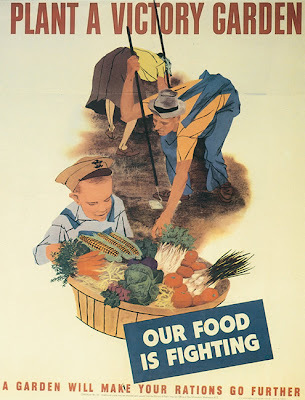 Same day I caught up on the goings on at the 1/10 acre sustainable homestead farm in Pasadena, California, and came across this inspiring post about home gardening and food security which quoted this very poster. Thought it was a sign that I needed to share both. Another article which argues for individual gardens and references Victory Gardens. Motivation abounds for starting one in the new place. Can't wait to get settled in and get started. All my fresh veggies are coming to me with green tops included so I'll have lots of stuff for the compost pile. "The single greatest lesson the garden teaches is that our relationship to the planet need not be zero-sum, and that as long as the sun still shines and people still can plan and plant, think and do, we can, if we bother to try, find ways to provide for ourselves without diminishing the world." I LOVE Michael Pollan. His books, The Omnivore's Dilemma and In Defense of Food, rock my world. I'm definitely planning some backyard composting and micro-gardening in our new place too. And I'll be sure to blog the progress of our two foot strip of dirt.